Yesterday, I saw an advertisement in a newspaper about the launch of flights on the Delhi-Ludhiana (DEL-LUH) route (a related news story). I was both surprised and elated, until a thought struck my mind. What benefit, if any, would flying on a LUH-DEL flight provide to a passenger, compared to traveling in a fast and luxury train such as Shatabadi or Rajdhani? I've arrived at an answer to this question by comparing the "room to room" time (i.e., the time it takes for a passenger to reach from his cabin/room in Ludhiana/Delhi to his cabin/room in Delhi/Ludhiana, respectively) for air journey and train journey. Bottom line: Flying between Delhi and Ludhiana does save time, but not enough, in my opinion, to justify the extra expense, especially when one can avoid wastage of time during the train journey by working on a laptop/reading a book/etc. @viciousinstints: True, it's an additional option, and there doesn't seem to be any harm in having an extra option. In my opinion, for some people and in some situations where the extra expense is worth less than the net benefit obtained, this flight makes complete sense. I have flown this DEL-LUH-DEL a few times recently. It was a good experience. Ludhiana is a manufacturing city and exports a lot also it has a textile hub. 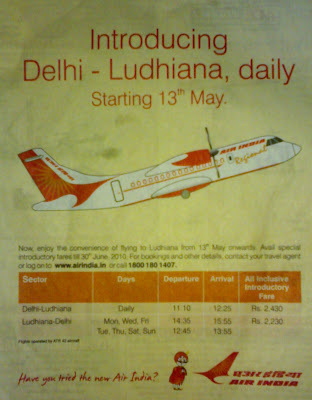 When buyers from western world come they can connect in Delhi and come to Ludhiana by afternoon.It was very amazing journey with free Meal tray (Sandwich,softdrink,bakery sweet).The flight was though delayed due to Routing of aircraft coming from Allahabad to Delhi with loads of Kumbhmela tourists.Air India should promote it more in targeted textile / metal industry magazines abroad than local newspapers.Its also suitable for reaching Punjab native villages those who live from Mumbai etc.